With more than 25 million copies sold worldwide, "The Diary of Anne Frank" is one of the most powerful personal testimonies to have come out of the Holocaust. Anne Frank, a young Jewish girl form a well-to-do family, wrote the diary during her family's two years of hiding in Amsterdam to escape deportation and death at the hands of the Nazis. Her diary, left behind in the hiding place, was published after the war. The appeal of Anne's writing was in its frank and sensitive portrayal of the feelings and emotions of a young teenager coping both with her challenges of growing up and with the exceptional circumstances her family was facing. In the years after the horrendous scale of the Holocaust was revealed. Anne's warm, touching, often humorous, memoirs helped personalize the human dimension of the Nazis implementation of the "the final solution" in which six million Jews were systematically executed. Yet as a document of the Holocaust Anne's diary was incomplete, ending as it did three days before her family discovery and deportation by the Nazi's. There is no written record from Anne after August 1, 1944. Her fate and that of her family largely remained a mystery in the decades after the end of World War II. More than a decade ago, Dutch filmmaker Willy Lindwer set out to solve this mystery. The answer was in his International Emmy Award-winning documentary film, The Last Seven Months of Anne Frank. Lindwer's film recounts Anne's fate through the testimony of seven women who survived the hell from which Anne Frank never returned. All of them shared experiences with her, either in the Westerbork concentration camp in Holland or later in Auschwitz or Bergen-Belsen. Even before the war some of them had been close friends of Anne, her father, mother and two sister. The documentary film was broadcast in many countries; the book, which included a complete transcription of the interviews, was translated into nine languages: English, Japanese, German, French, Italian, Hebrew, Korean, Portuguese and Dutch. Together, they helped complete the circle of the story of Anne Frank while also revealing much about one of the least known aspects of the Holocaust, the fate of the woman. Today, Anne Frank is still a powerful symbol in the public's mind and the subject of ongoing research and writing as well as theatrical and documentary film treatment. This includes the recent presentation on Broadway of a revised version of the play "The Diary of Anne Frank". To mark the upcoming 70th anniversary of Anne's birth on June 12, 1929, the documentary will be released in a re-edited 50 minute version with a new introduction by Hanneli Pick-Goslar, Anne's childhood friend. Surprisingly perhaps, with all of this current interest in Anne Frank, there has yet to be a dramatic film presentation of her life after she and her family were deported. That is about to change as Willy Lindwer puts her unique resource material and knowledge into the creation of a feature film which will tell the tragic story of Anne Frank's final ordeal: The Last Seven Months of Anne Frank. After their arrest, instead of immediately executing them, the Nazis transfer the Frank family to one of the least known cogs in the vast machine of the "final solution": the Westerbork concentration camp run by Dutch civilian and military police, collaborating with its Nazi commanders. By the end of the war, more than 100,000 Dutch Jews were transported from Westerbork to the Sorbibor and Auschwitz death camps. Three weeks later, despite her father Otto's desperate efforts to save the family, they are loaded into a crowded cattle car and make the three-day journey to Auschwitz standing up. It is the last train from Westerbork to Auschwitz, carrying 1,019 people. Anne is 15 years old. At the first "selection" in Auschwitz, Anne and her sister Margot and their mother Edith narrowly avoid the gas chamber. Dr. Mengele assigns Anne to Barracks 29. There, along with the other women, she is forced to strip in front of Nazi officers and to have her head and body shaved. Accounts from Auschwitz tell of the two teenage sisters' separation from their mother and their struggle to survive, often with the help of other women prisoners. Knowing that the war is coming to an end, Anne and Margot have hopes that they will survive. Indeed, as the Red Army approaches, the Nazis transport thousands of Auschwitz's women to Bergen-Belsen where there are no gas chambers. No gas chambers are needed. Typhus is rampant and Anne and Margot become increasingly sick and emaciated. There is a slight ray of hope when Anne miraculously establishes contact with her closest childhood girlfriend, Hanneli (mentioned frequently in the Diary) across a barbed-wire fence. There is a horrible scene when Hanneli throws a few bits of food over the fence for Anne but it is taken by another woman. On the following night, Hanneli tries again and this time Anne successfully grabs the morsels. This is Hanneli's last contact with Anne. Hanneli survives and is recuperating in a Dutch hospital shortly after her liberation when she has a visitor. It is Otto Frank. 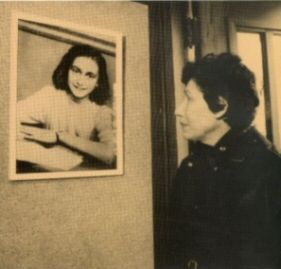 Hanneli tells Otto that that she saw Anne in Bergen-Belsen and that she is alive. It is Otto who breaks to her the devastating news that Anne and her sister died of typhus in Bergen-Belsen three weeks before the liberation. Otto and Hanneli return to Amsterdam together to try to rebuild their lives. According to Hanneli, Otto and she became like father and daughter. They return to the hiding place. It is here in the hidden annex that the Christian woman who had tried so hard to save the Frank family, Miep Gies, hands out Otto the diary left behind by Anne seven months earlier. The Last Seven Months of Anne Frank is a powerful and moving completion of one of the most dramatic stories to have emerged from the Holocaust.